In 1737, a parish workhouse was established at Knaresborough next to the church. The workhouse inmates wove flax. 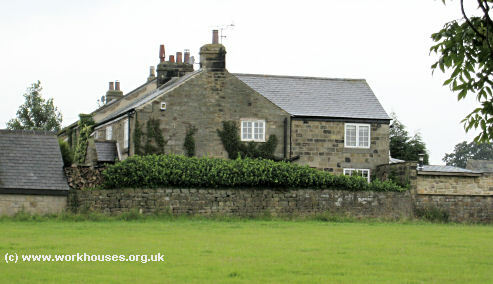 Harrogate and Bilton once shared a workhouse at Land Green Farm near Pannal. This is presumably the establishment at Burn (or Burnt) Bridge shown as a poorhouse and school on the 1853 map below. Burnt Bridge former poorhouse, 2008. 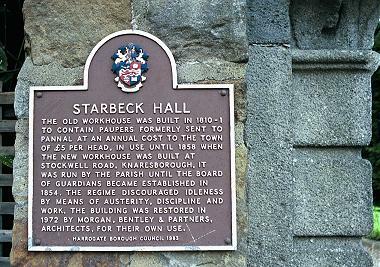 In 1810, Harrogate erected its own workhouse at Starbeck, a building now known as Starbeck Hall. 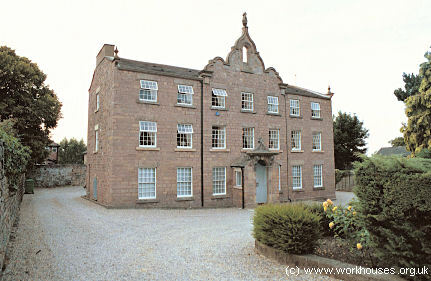 The parishes of Allerton, Brearton and Dacre shared a workhouse at Scriven which was is said to have occupied the whole of the village green. A label identifying the workhouse can just be made out on the 1853 map shown below. Messrs. Tipling and Dumoire, Overseers. Mr. Frost, Master of the Workhouse, Churchwarden. Mr. Peacock, Overseer of Harrogate. Mr. George Howe and Robert Calverley, Overseers of Scriven. Joseph Wilson, Master of Workhouse at Knaresborough. There are workhouses in Knaresborough, Scriven and Harrogate. No work in any of the three workhouses, except that at Harrogate they have a garden nearly an acre in extent, which the inmates cultivate. There are no able-bodied men in Knaresborough workhouse; only two in Scriven workhouse; and three in Harrogate. No distinction in fare, except that one man in Harrogate workhouse who is worked hard at a coachmaker's has meat every day; the others in Harrogate and Scriven workhouses have meat four days a week; in Knaresborough they give meat three days a week; the other days, puddings and rice-milk and broth : for breakfast and supper, milk-porridge and meal. No separation of the sexes in the three workhouses, except in the sleeping-rooms, which are on separate floors. The expense of maintenance in Harrogate for all above 10 years of age is 2s. 11d. per head per week, and under 10 one-half; this has been the average for five years. In Scriven, the average, including children, is 2s. 7d. In Knaresborough they have a sick room, into which the paupers who die are removed; the other workhouses have not such accommodation. Knaresborough, 65l. per annum, and board and lodging, with the exception of animal food, which he finds himself. Harrogate, 521. 10s. per annum, and board and lodging. Scriven, 30l. per annum, and board and lodging. Butcher's meat is furnished to all the workhouses at about 4s. 8d. per stone of 14lbs. Mr. Peacock thinks that if they had five or six acres of land they might profitably employ the paupers in its cultivation; this would not do for the other two townships, they say, because the paupers there are chiefly weavers. 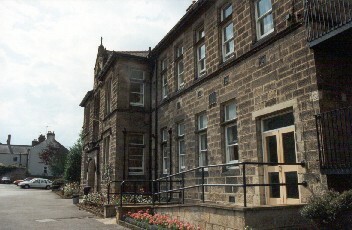 The children in Knaresborough and Scriven are sent to the national school. At Harrogate they have established a little school a short time ago, of which a pauper woman is the teacher, and which the master thinks preferable to sending them to the national school, which they are not sure they will always reach. The masters (of workhouses) think it would be hard to forbid tobacco to the old men and tea to the old women; but it is generally thought there would be no objection to a regulation forbidding the paupers to leave the walls of the workhouse, particularly if there be a garden attached. At Harrogate, the master when he sends the children to the Sunday school sends a note with them, mentioning the time of their departure, and the master of the Sunday school sends a note back with an account of their behaviour, and if not good, the defaulters go without dinner. None of the workhouses are incorporated; but to Harrogate 18 other townships contribute 5l. a year, and pay for each pauper what it costs the establishment, generally 2s. 11d. per head per week. In all the three workhouses there is, however, so little restraint that when a man gets in he seldom leaves. Mr. Peacock mentions an instance of a man who refused to work and was prohibited food, and on his going before the magistrates was committed to the house of correction, and lie has never since applied for relief. Though the idea is new to the gentlemen present, their prevailing opinion is, that an enactment prohibiting relief to the able-bodied, except in a workhouse under proper restrictions, would be highly beneficial. The formation of new Poor Law Unions in West Yorkshire was severely hindered by the existence of four Gilbert Unions (Barwick, Carlton, Great Ouseburn and Great Preston) whose constitution had made them exempt from the provisions of the 1834 Poor Law Amendment Act. The scattered distribution of these Gilbert Unions cut across the neat pattern of Poor Law Unions proposed by the Poor Law Commissioners as shown on the map below. Yorkshire Gilbert Unions map, 1838. It was not until 1850s that the Commissioners' scheme began to take place with the formation of the new Unions of Ripon (1852), Knaresborough (1854), Wharfedale (1861), Wetherby (1861), and Tadcaster (1862). County of York: Bilton-with-Harrogate (2), Brearton, Burton Leonard, Cayton with South Stainley, Farnham, Felliscliffe, Ferensby [Ferrensby], Flaxby, Follifoot, Goldsborough, Hampsthwaite, Haverah Park, Killinghall, Knaresborough (4), Nidd, Pannal (2), Plumpton [Plompton], Ripley, Scotton, Scriven-with-Tentergate (2), Walkingham Hill with Occaney. The population falling within the Union at the 1851 census had been 15,473 with parishes ranging in size from Walkingham Hill with Occaney (population 21) to Knaresborough itself (4,879). The average annual poor-rate expenditure for the period 1852-4 had been £3,733 or 4s.10d. per head of the population. 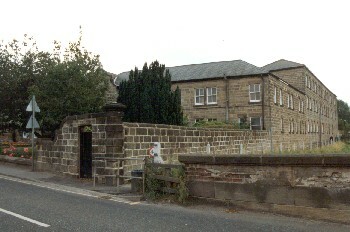 Initially, the new union continued to use the existing workhouses at Knaresborough and Starbeck. 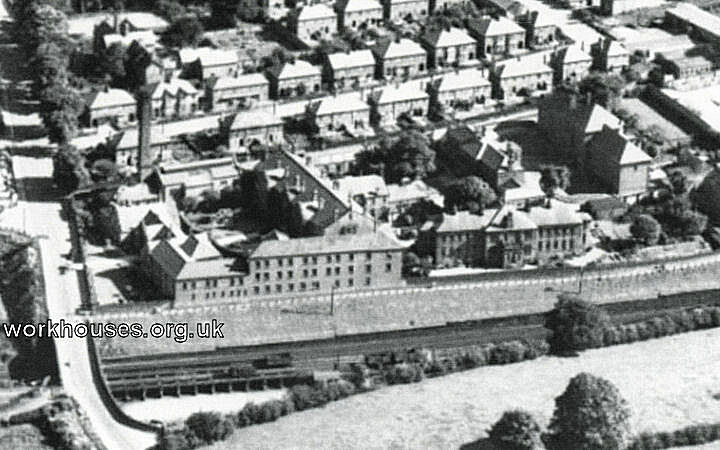 In 1856-7, a new union workhouse was built at a site on the east side of Stockwell Road in Knaresborough. It was designed by Isaac Shutt of Harrogate. The site layout is shown on the 1932 map by which time the workhouse was referred to as a Poor Law Institution. Knaresborough aerial view from the north-east, c.1990. Knaresborough aerial view from the north-west. The entrance block at the east had a central archway, with a boardroom at the north side, and porter's room and receiving wards at the south. The main block was T-shaped with the Master's quarters at the centre, males' accommodation in the north wing and females' in the south. The dining hall and kitchens lay at the rear centre wing. 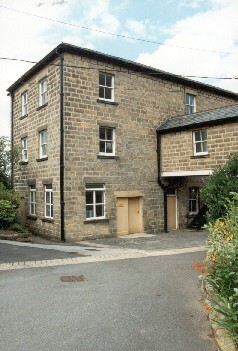 An infirmary was added to the rear of the workhouse in about 1870. Knaresborough general view and vagrants' entrance from the north-east, 1989. Knaresborough from the north-west, 1989. New vagrants' wards were added along the north and south sides of the site in 1870-92. Knaresborough vagrants' block from the south-east, 1989. Knaresborough vagrants' block from the south-west, 1989. A second infirmary was added at the north of the site in the 1890s. This became the male infirmary and a female infirmary was erected at the west of the site in around 1905. The original infirmary was converted for use as nurses' quarters, children's nursery, and isolation hospital. Knaresborough 1896 infirmary from the south, 1989. Knaresborough 1896 infirmary from the west, 1989. 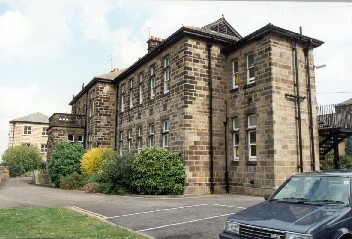 Knaresborough 1896 infirmary from the south, c.1990. 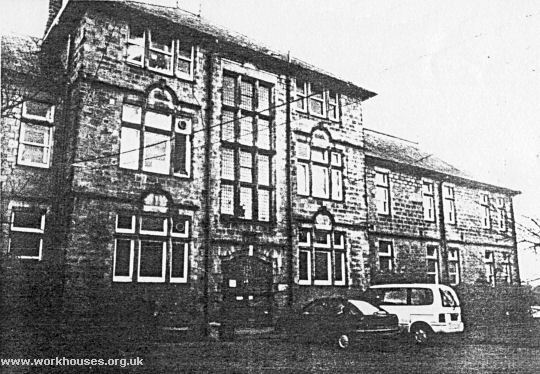 Knaresborough 1905 infirmary from the east, c.1990. After 1930, administration of the institution passed into the hands of the West Riding County Council and became part of a new Public Assistance district called Claro centred on Knaresborough. A plan of the site at that date is shown below. 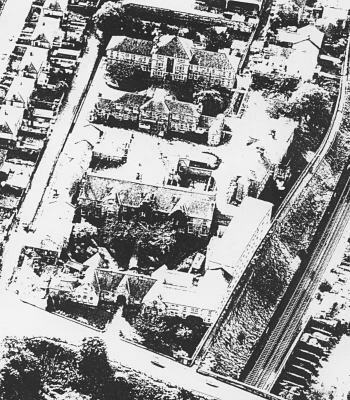 The former Knaresbrorough workhouse became mainly used to provide care for the elderly, with the remaining orphan children being moved to a children's home in Scriven in 1937. The vagrants' wards, however, continued in use until 1950. 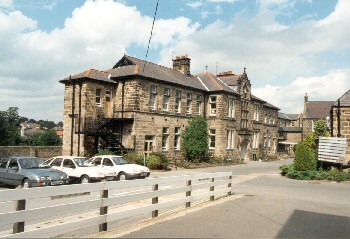 Under the National Health Service, the site became Knaresborough Hospital. In 1996, the land was redeveloped for housing and all the old buildings have been demolished with the exception of some parts of the perimeter walls. 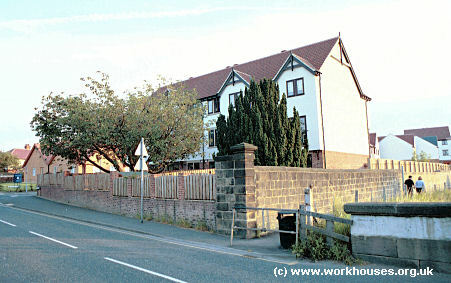 Knaresborough former workhouse site from the north-east, 2000. 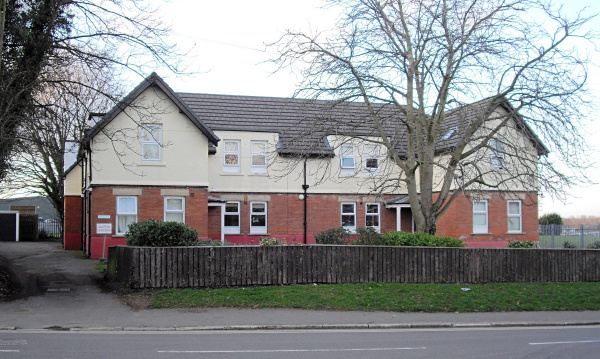 By the early 1900s, the union had opened a children's home at 29 Bond End, Knaresborough. 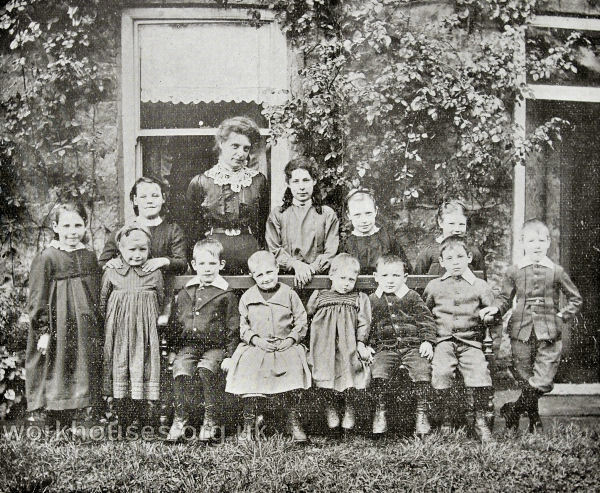 The picture below shows the children and house-mother in around 1904. 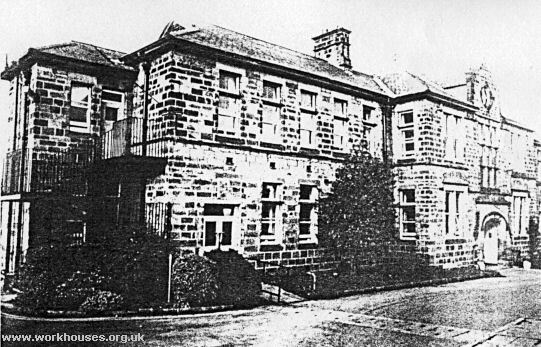 Knaresborough Union children's home, c.1904. In 1916, Major Collins, from a noted local family who were related to Churchill, gave the Knaresborough Union a plot of land on Stockwell Lane, on which to erect a pair of children's cottage homes. 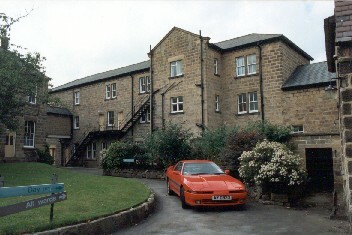 The girls' home, named Sunny Lea was at the left and the boys' home, Fairholme, was at the right. 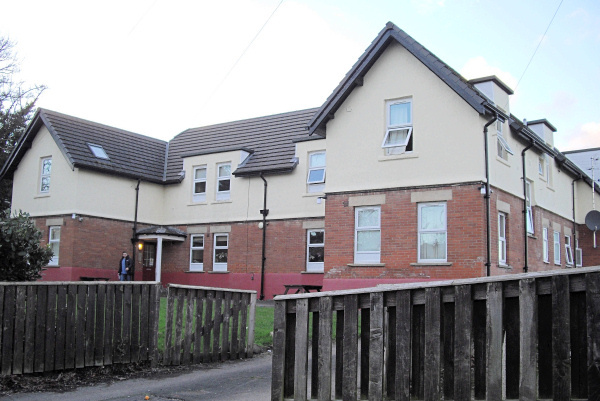 Each could accommodate up to 15 children under the care of a foster mother. In 1916, the girls' foster mother was Miss Harwood and the boys' was Miss Matson. After 1930, the homes were taken over by the West Riding County Council. Former Knaresborough cottage homes, 2016. North Yorkshire County Record Office, Malpas Road, Northallerton DL7 8TB. Few local records survive — holdings include: Guardians' minutes (1854-1930); Ledgers (1854-72, 1925-30). Many thanks to Gary Kirby and Jayne Jackson for their photo contributions.